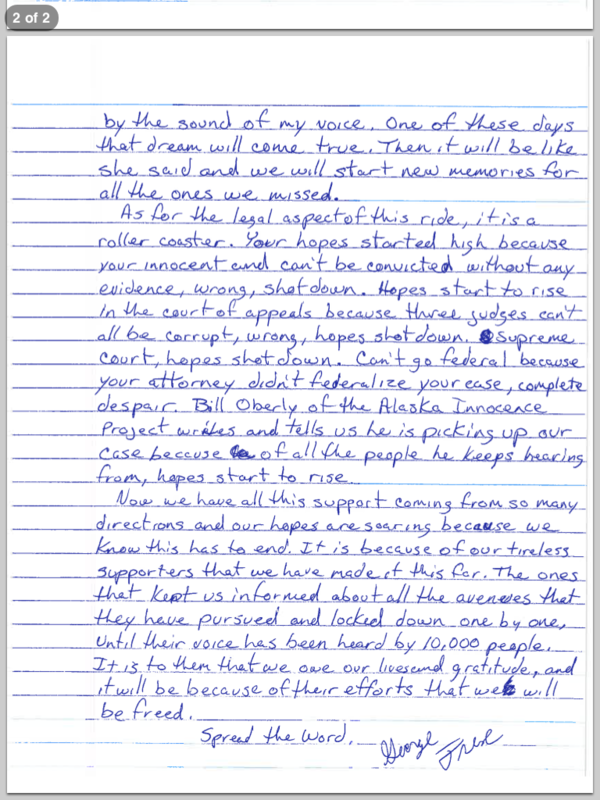 This entry was posted in George, Letters from the Four, The Police and Prosecuters, The Trials and tagged Fairbanks Four, George Frese, Innocence Project, Letter from prison, Police Corruption, wrongful conviction by thefairbanksfour. Bookmark the permalink. What a lettter,made me cry to know how Brave these young men are.To be away from loved one’s has to be so hard.I am so glad that they have so much support and that they know how it’s has brought people that have never met them out in support of them.I have never met any of them but they have kept me awake many a night wondering how they were convicted.Having 3 son’s of my own and knowing this could happen to anyone just scares me to death.One day(soon I hope) they will be free .This just broke my heart hearing about him not being able to tell his child when he will be home.Just means an extra prayer tonight. Thanks for having them in mind, and for taking action on this – your letter to the editor was heartwarming and brave and your support means a lot. Wow! 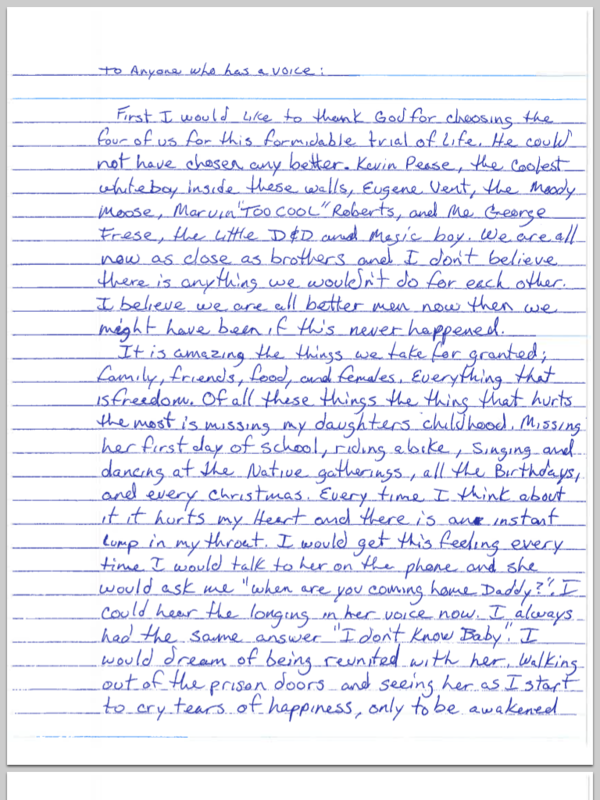 This was the most emotional letter I could read. I so cried. All I can say is that. They will come home. I think this is really sad… they all should be freed… they do not deserve this…. just because they are Alaska Native they have to be convicted… PLEASE LORD free these Mens…. This is the first time that I have read a letter from this case in a long time,My heart and support goes out to them. May god bless. God will be with you through all this! Wow! that was really strong words and touching! Words that came straight from the heart, mind and soul made me really feel the hurt! GOD BLESS them every day and minute!